The South Asia Centre at LSE recently organised an annual summit where Professor Michael Cox delivered a lecture on the historical relation that LSE fostered with India. This note is a summation of the ‘LSE in India’ panel discussion, along with my personal reflections on the talk in the context of diversity. Sharing the dais with historian and scholar Ramachandra Guha, Professor Cox stressed the global characteristic of the institution – not just within LSE but in terms of the ties that it has with the rest of the world. 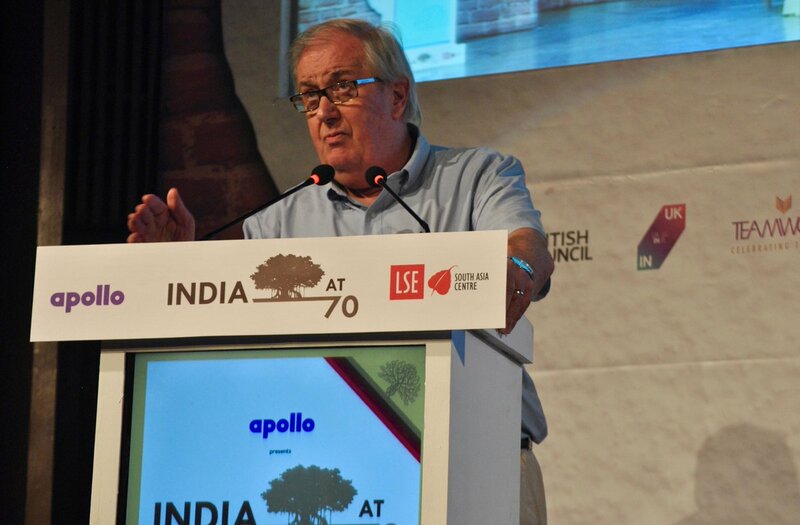 Both the speakers argued that just as LSE had a tremendous impact on the formative stages of Indian democracy and continues to shape ideas in India, Indian influence within the institution is palpable in several milieus. Professor Mike Cox is the director of LSE Ideas and is currently authoring a book on the history of LSE. He proudly proclaims himself to be one of the biggest ‘patriots of LSE’. While introducing Professor Cox, Ram Guha presented Cox as a ‘polymath’ whose work cuts across ‘an intersection of history, politics and international relations’. Ram Guha was the 2011–12 Philippe Roman Chair of International Affairs and History at LSE. Referring to an article that he had written on ‘The LSE and India‘, Guha opined that LSE’s contribution towards the intellectual, social and political history of the 20th century was more substantial and ‘enduring than Oxford or Cambridge’. In other words, within the social sciences, particularly in regard to its impact on public policy, LSE has had a ‘definitive and formative influence’. Both speakers emphasised the importance of taking cognisance of LSE’s relations with India because they transcended colonial relations with the country. LSE’s key focus on the social sciences since its inception established the foundations of inclusivity and the acceptance of ideas, cultures and practices that the institution actively promotes. The disciplinary foundation of the School is located in the social sciences and in economics and its ‘utilitarian’ terms are understood to be useful and applicable in real terms. Thus the social science lineage of the institution is not merely a strategic endeavour to build a diverse institution, but something that has been embedded within the ethos of the institution. The founders of LSE leaned on the socialist side. Guha contended that some of the strongest critiques of ‘totalitarian societies’ and authoritarian regimes have emerged from LSE. He mentioned two remarkable Eastern European émigrés, Karl Popper and Friedrich Hayek, whose works proved significant in critically evaluating some of these regimes. Speaking of the ‘fascinating’ history of LSE, Professor Cox shared some of the reflections that have emerged while writing his book on the School. He acknowledged the work of Ralf Dahrendorf in doing a much more elaborate task of writing the institutional history of LSE and recognised Dahrendorf’s influence on his work. Professor Cox explained that LSE was founded by four individuals: a couple, Beatrice and Sidney Webb, whose ideals were deeply rooted in Fabian socialism; Graham Wallace, a political theorist and political scientist; and George Bernard Shaw, an Irish playwright. The history of LSE’s inception was interesting and different from other universities in terms of its patronage. It was a conscious decision of its founders to locate LSE within London (a city) in order to prevent it from becoming an ‘ivory tower’. According to Cox, the purpose of the School was ‘social betterment, rational decision making… it would appeal to the professionals – those who would be running a rational collective state.’ The intention was to make LSE a ‘purely social science institution’ and that is how it has remained to date. The School has grown enormously over the years; it has approximately 10,000 staff and students and is very diverse in its composition. According to Professor Cox, intellectually LSE has had an enormous impact on subject areas such as anthropology, economic history, philosophy, political science and – of course – economics, and, as its founders intended, it has had an impact on the rest of the world. The image of LSE is regarded as leaning politically towards the left and on the ‘socialist side’, argued Professor Cox. A very obvious reflection of this is palpable in the polemic written by US Senator Patrick Moynihan, who spent a number of years as a student at LSE. Moynihan criticised LSE and its Fabian socialist ideas for ‘destroying the 3rd World’. Professor Cox argued that this reaction towards socialist ideas made LSE ‘anti-capitalist, anti-imperialist and indeed by implication “anti-America”‘. Professor Cox stressed the reputation of LSE as being more global than local. LSE, he argued, is ‘from everywhere and not from somewhere’. Whether it is in post war era in the U.S and Europe or in the contemporary times LSE has had much more influence abroad. The current student composition of LSE is a clear indication that it is one of the preferred institutions for students from Asia as nearly one third of students at the School are from the continent. Historically, India has always had a very ‘special place’ within LSE and LSE, as Ram Guha also earlier pointed out, has had an influence on modern state building in unique ways. Professor Cox quoted Ralf Dahrendorf, who believed that ‘India and LSE were soul mates.’ He named Vera Anstey as one of the first academics from LSE to specialise on India, who is acclaimed as one of the great figures during the interwar periods. As far as the student composition goes, LSE had an inflow of Indians even before the 1900s. In 1912, the first student union president was an Indian. Professor Cox urged those at LSE to go to see the photographs on the fourth floor of William Beveridge and his students in a School photo. An enormous number of students in those photos seem to represent South Asia and thus the photos are truly evocative of the ‘internationalism’ of the School. Professor Cox claimed that during the interwar period LSE certainly had the greatest number of international cohorts compared to other universities within the UK. Professor Cox mentions that there are several memoirs from international students, particularly Indians, who found London challenging but liberating and LSE very democratic. LSE provided the grounds for students from different countries forming their own cohorts with their own social and cultural leanings. Yet at the same time these cohorts intermingled without forming any sort of hierarchies within the institution. LSE from its inception was very inclusive and welcoming of diversity and there was an absence of the formality that tends to strain environments in many other academic institutions. He gave examples of the two leading universities in the UK, where for the longest time one had to have a knowledge of Latin. Secondly, the fact that LSE is situated in the heart of a cosmopolitan city ‘where you could be relatively anonymous’ made it very appealing for international students. The history of the School’s directors (as the highest office holders) at LSE is a very interesting indication of its diversity, given that the incumbents of its highest office were not only from multiple academic backgrounds but were also from different ethnicities and genders.Having been founded more recently than Cambridge or Oxford, of the 16 directors that LSE has had since 1895, five positions have been held by individuals from different national origins and three women have been appointed to the office. Dame Judith Rees was the interim Director of LSE between 2011-2012 The most recent appointment as the director of LSE has been Dame Nemat Shafik, an economist of Egyptian origin. The University of Cambridge has had only one woman vice chancellor in its history, in 1975. It was only in 2016 that the University of Oxford appointed its first female vice chancellor. Diversity is an evolving process, as Mike Cox argued, and undeniably the institution faces many challenges in meeting many of its objectives. But as a critical and self-reflective institution, LSE acknowledges its hurdles and constantly strives towards addressing its shortcomings in the areas of diversity. The Equity, Diversity and Inclusion (EDI) unit is one among many efforts of the institution to engage with issues of diversity by ‘promoting equitable treatment, championing diversity and developing an inclusive LSE’. While thinking of diversity it is also essential to acknowledge the crises of our current times when globally there is a great amount of unrest that undermines tolerance and seriously jeopardises peace. The recent political developments around the world have been quite distressing and have challenged some of the basic tenets on which some of the biggest democracies of the world were established. Britain’s exit from the European Union (EU) risks damaging higher education over the long term, with a significant proportion of LSE’s staff and students from the EU being pushed into uncertainty about their resident status within the United Kingdom. Professor Julia Black, interim director of the LSE, has issued a statement that reiterates the School’s commitment towards the international community. In a society that is getting increasingly fragmented, it is institutions of higher learning that should take the lead in reinstating solidarity and ensuring the flourishing of a truly multicultural society. To watch and listen to the entire panel discussion, click on this link of the India @ 70: LSE India Summit 2017. About the author: Paroj is an LSE PhD researcher at the Department of Geography and Environment and also a member of the LSE EDI team. Her research is an ethnographic study of spatial practices of pavement dwellers in Mumbai and she is currently in India for a year long fieldwork. She tweets at @smirp858. The image has been sourced from Sonali Campion, Communications and Events officer at South Asia Centre, LSE.